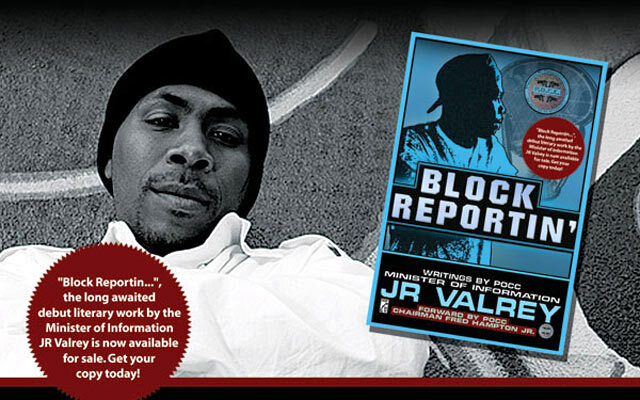 JR Valrey is a renown international journalist who, for years has been focused on producing media that sheds light on the social issues of the oppressed; he has recently published a book by the name of Block Reportin’. Paul Mooney, Cynthia McKinney, Mumia Abu Jamal, Freeway Ricky Ross, Mos Def, and Gil Scott Heron to name a few. The book opens with an interview with one-time East Oakland drug kingpin Lil D, who is now incarcerated. The interview gives a modest peak into the life of Lil D: his past, his current state, and what he plans to do upon being released. Malcolm Shabazz, grandson and first male decedent of Malcolm X spoke to JR about the pressures of baring his grandfather’s name at a young age, the incident where a young Malcolm Shabazz lit a fire to a house that would burn down and take the life of his grandmother- Betty Shabazz, and the growth Malcolm Shabazz has experienced since that time. His book, Block Reportin’ can be found at Marcus Books, Revolution Books, and a in your neighborhood as JR takes his book on tour… block to block. I would like to publically salute JR Valrey for his work, dedication, and growth.